Death, taxes, and 3dB Loss. Seriously. It’s inevitable, like death and taxes. There’s at least a 3dB loss from every 1×2 splitter. In fact, there could be more. Why is that? To understand why there’s no escaping a 3dB loss, you need to understand three things. The first is the principle called “conservation of energy.” That means that in this universe, you can’t just pull energy out of your hat. If you need electricity, you have to make it somewhere, and you can run an electrical appliance without electricity. Putting aside things like nuclear fusion and other concepts that are way too far off topic for this simple discussion, you can’t get energy from out of nowhere. The second is that the signal that goes through your splitter is made of energy, and what you’re doing is splitting it in half. So if you know that you can’t just invent energy from nowhere, you know that half the energy goes out one port and half goes out the other port. The final thing you need to understand is what “3dB loss” means. dB is short for decibels and if you really want to get deep into that discussion you can, here. Decibels are basically a way of measuring anything that grows or shrinks by massive amounts without making a huge difference. A signal that is 30dB stronger is 1,000 times stronger. Measuring in dBs makes that difference more understandable. There is a direct correlation between the number in dBs and a regular number. Positive dB numbers are greater than 1 and negative dB numbers are less than one. It so happens that -3dB (a 3dB loss) corresponds to .477, or almost exactly half. This doesn’t change from thing to thing, in other words, -3dB is just another way of saying that you only have 47% of what you had before. So let’s add it all up. You don’t ever magically get more energy. Signals are made of energy. When you split a signal, half goes one way and half goes the other. Which all adds up to, every time you split a signal you lose at least 3dB. Sometimes you lose more because the components in the splitter might also sap a little signal. If you’re really clever, you can say “what about amplified splitters. They don’t lose 3dB…” Well Mr. Smartypants yes they do, they just put it back. 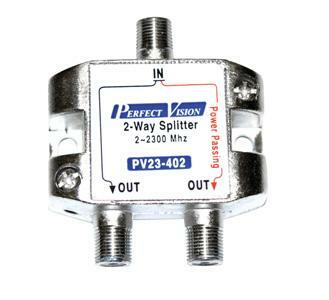 An amplified splitter uses energy that comes from the electrical outlet to pump a signal back up to where it was. But that does come at a cost, sort of like making a xerox copy of a xerox copy of a xerox copy. Every time you do that, it’s not a perfect copy, you lose something. In signal terms, we call that “increasing the noise floor” and it’s not a good thing. Would an antenna work if you pointed it straight up? Why upgrade to DIRECTV’s Genie?